Lens: The clear protective case over the watch dial; usually a Plexiglas or mineral disc. Hardlex crystals, a heat-treated mineral crystal, and sapphire crystals are especially scratch-resistant. I-Ring: A seal within the casing which the glass lens rests in to reduce shock and friction between the glass and metal. Case: Frame that houses the watch mechanism. Bezel: Ring that attaches the crystal to the watch case, also sometimes decorated to be used as a timing feature for divers. date. The button also winds many mechanical watches. 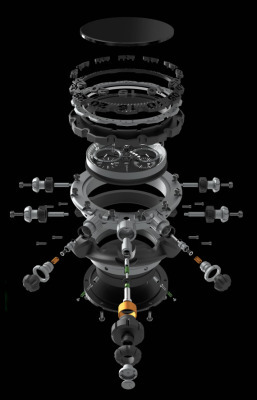 Lugs: The hardware that connects the case to the watch band. Strap/Band: The cuff that wraps around the wrist making the piece a wrist watch. Metal bands are called bracelets. Leather, rubber or fabric bands are called watch straps. Clasp: The hardware that fastens the band together; a buckle. Dial: The face of a watch case that displays the timekeeping functions. Subdial: A small window or register with its own hands that is placed on the main dial. Chronograph watches have three or four subdials to display multiple functions. Movement: The actual guts of the watch that makes the whole thing work. This can be automatic, quartz, mechanical, digital etc. Housing: A piece of cuistom die-cut plastic that the movement sits inside and keeps everything stable inside the casing. O-Ring: A rubber-band seal normally coated with silicon which rests between the caseback and the housing to reduce the possibility of moisture entering the watch. 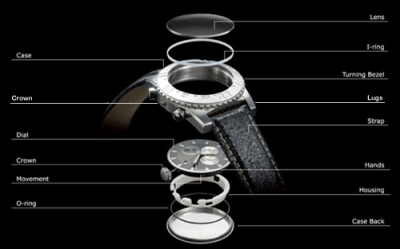 Case Back: A removable cover (normally stainless steel) that allows access to the internal mechanism of a watch.